Cleo Addams is a published science fiction author. In her free time, she enjoys researching and writing articles on various topics. While wandering around Walmart a few days ago in search of healthy snacks, I somehow found myself perusing the video game section to see if they had any Nintendo Switch consoles left in stock. Of course, they didn't. (I wasn't surprised.) It always amazes me how early in the year people start Christmas shopping. Here it is—a week before Thanksgiving— and people have already maxed out their credit cards. Honestly, I find it kind of ridiculous. But, I digress. If I hadn't ventured bravely out of the food section and into the games, I wouldn't have found this gem. 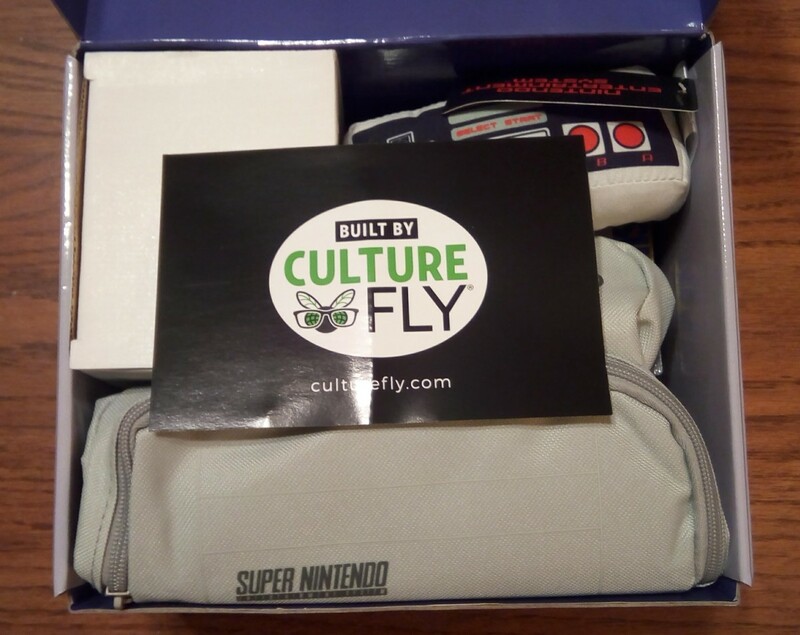 It's the Super Nintendo CultureFly Collector Box filled with official licensed merchandise from Nintendo. Admittedly, I've never purchased a box set like this before, but I grew up in the 90's and Nintendo was a huge part of my upbringing, so I opted to get it. The box cost $29.88, which isn't a bad price considering everything that you get. 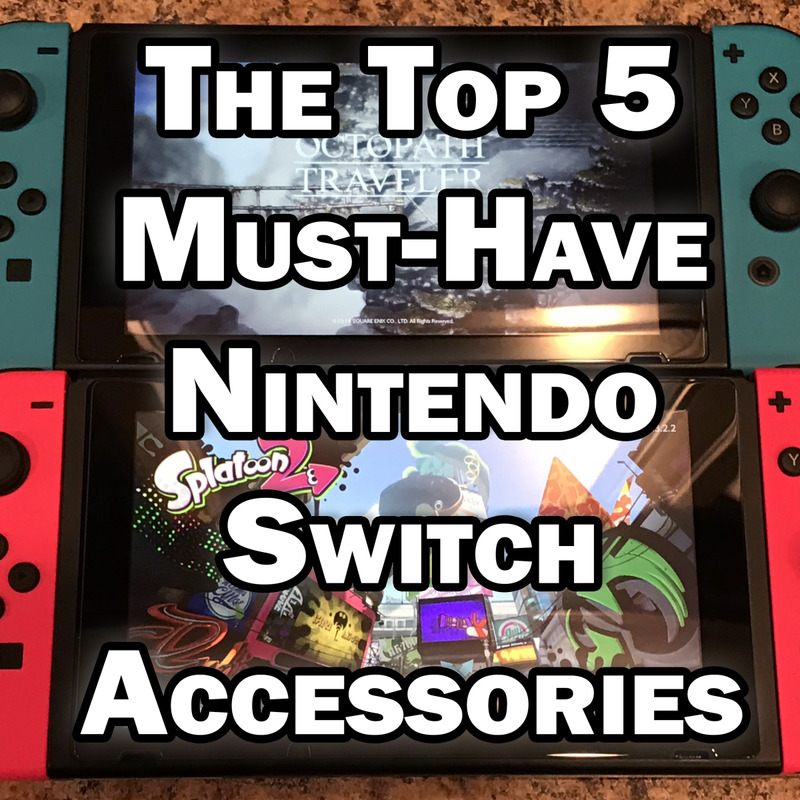 It contains a collectible coin, a set of four cartridge coasters, a plush toy controller, a heat changing mug, a mini notebook, a console backpack, and a mystery item. 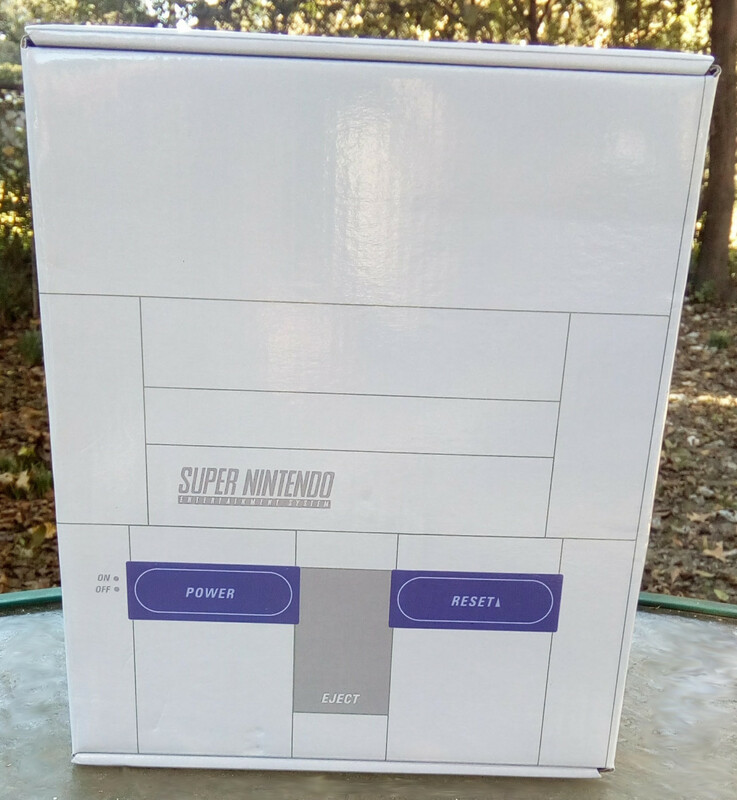 The box is designed to look like a Super Nintendo Entertainment System (SNES) with its gray body and purple controls on top. The back has the outlet and adapter ports, and the bottom has the rubber feet and even the FCC notice. In fact it's just about the same size of the SNES, except the depth is greater to fit all the collectibles inside. When first opening a box like this (or anything professionally packed to optimize space), I'm always in awe of how everything is neatly tucked and positioned inside. As you can see from the photo, the way the box is packed teases you with a glimpse of its contents. Fittingly, CultureFly's card is sitting on top. Turning the card over offers access to a 50% off coupon if you take a survey letting them know your feedback. After removing the CultureFly card from the top, the first thing that caught my eye was the plushie. 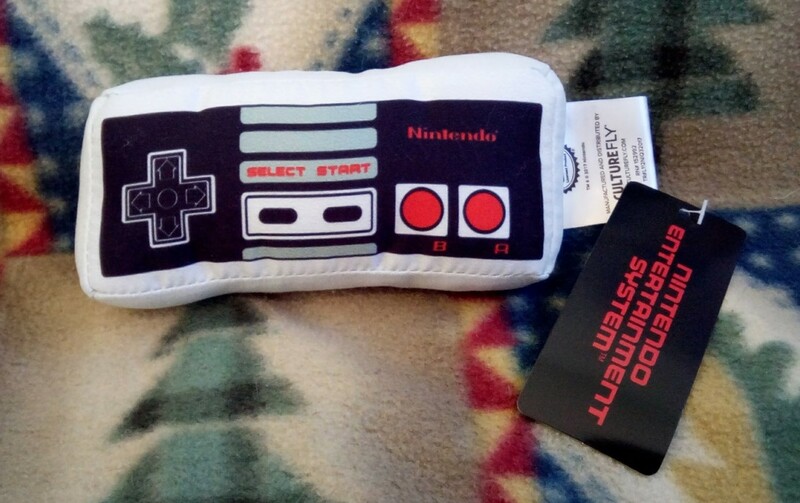 It's made to look exactly like the original Nintendo game controller and it's also the same size. For a second, I thought about taking this one and putting it on my desk at work, but then I thought better of it. It would look more at place on my bookshelf beside the original NES. 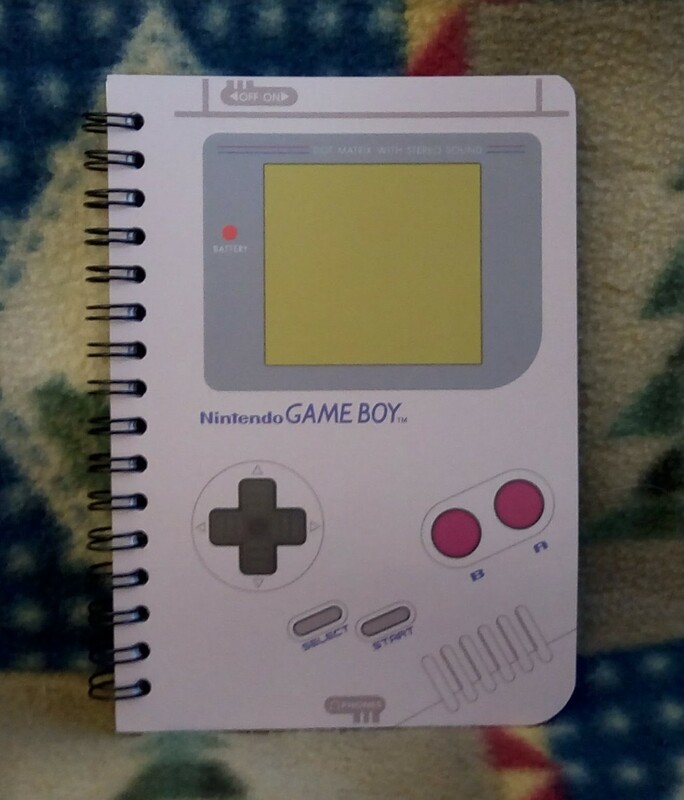 The mini notebook sports a Game Boy design on front and the notepad itself is cut into the shape of the device. It's spiral bound and the inside is graph paper - perfect for all of your 8-bit designs. 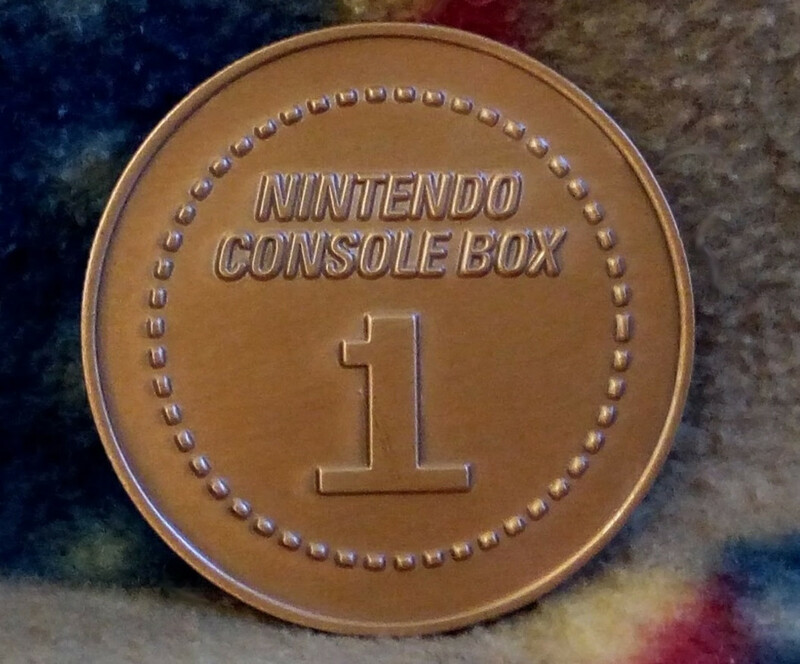 The Nintendo collectible coin is a nice, shiny bronze color with the words "Nintendo Console Box 1" on the front and a picture of the Nintendo directional pad on the back. It's sturdy and has a little weight to it. 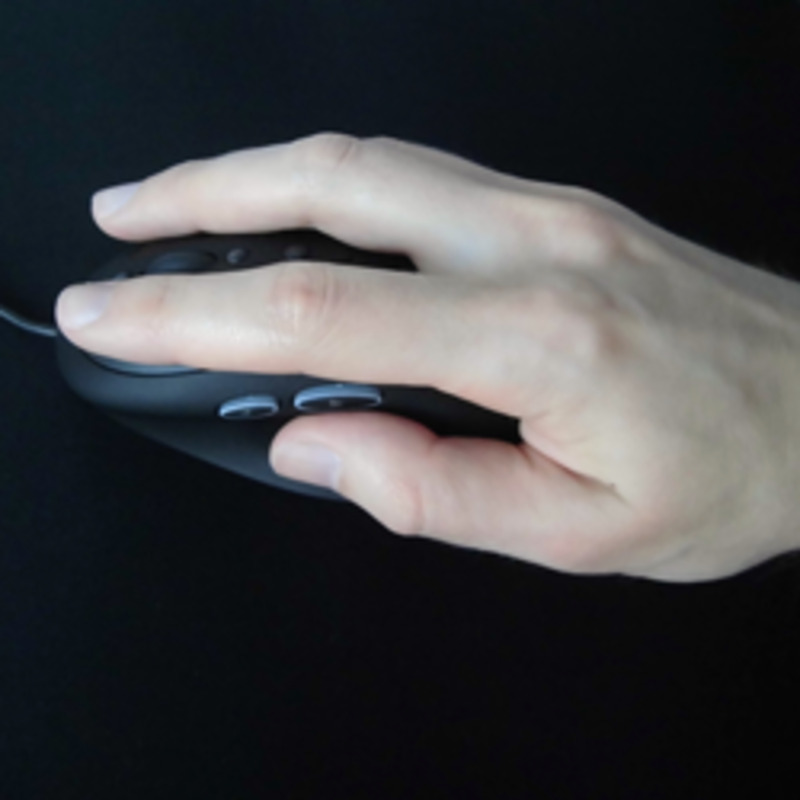 It seems to be well made and comes in a clear, plastic pouch suitable for storage or display. Side note: The fact that there's "Nintendo Console Box 1" on the coin makes me think they've already made plans to release follow-up boxes to this one. It'll be interesting to see what designs will go on the back of each. I sure hope that Mario and Luigi get a coin of their own! In this set, you get four coasters shaped like game cartridges decorated with hit titles for the original NES: Super Mario Bros, Duck Hunt, Metroid, and Super Mario Bros 3. The cartridge coasters come tucked neatly inside a retro NES sleeve. Unfortunately, this sleeve is made out of a thick cardboard and the original was a thin plastic. That's kind of disappointing considering that plastic can be very inexpensive and that's why factories choose to use it over other materials. I do love these coasters but, honestly, I feel like I'm missing a little bit of the nostalgia here with the cardboard. Further examining the coasters, I noticed that there's cork on the bottom and the top is made of a thin piece of cardboard with a protective coating. (Again with the cardboard?) These coasters are a fun and unique item, but they really should have made these out of plastic. If your cup sweats and the water breaks through the protective barrier; your coaster isn't going to last long. The heat change mug is decorated with the picture of a Game Boy on the front. 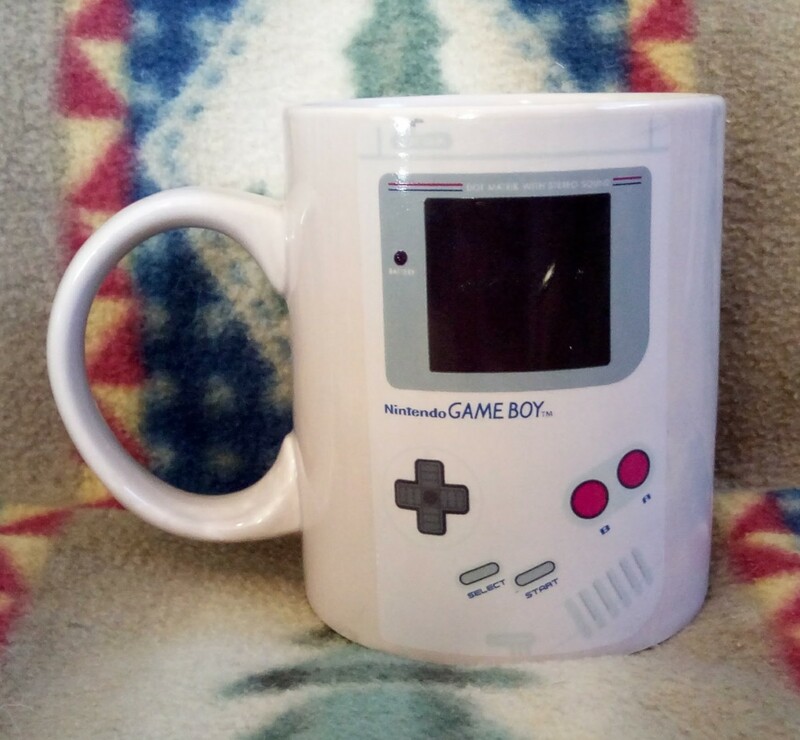 When a hot beverage is poured into the mug, the Game Boy's screen changes from black to green as if it's been powered on. The material of the mug is not listed on the item itself, but it seems to be a thick ceramic and is hand wash only. Author's note: My mug actually came with a nick on the screen of the Game Boy (as seen in the photo). I'm going to write to CultureFly and request a replacement. I think one of the coolest things in this collector's box (besides the coasters) is the Console Backpack. This is a cute little bag that measures 10" in length and 12" wide. It's decorated to look like a SNES console and has two compartments. The straps are accentuated by a purple ribbon on each. 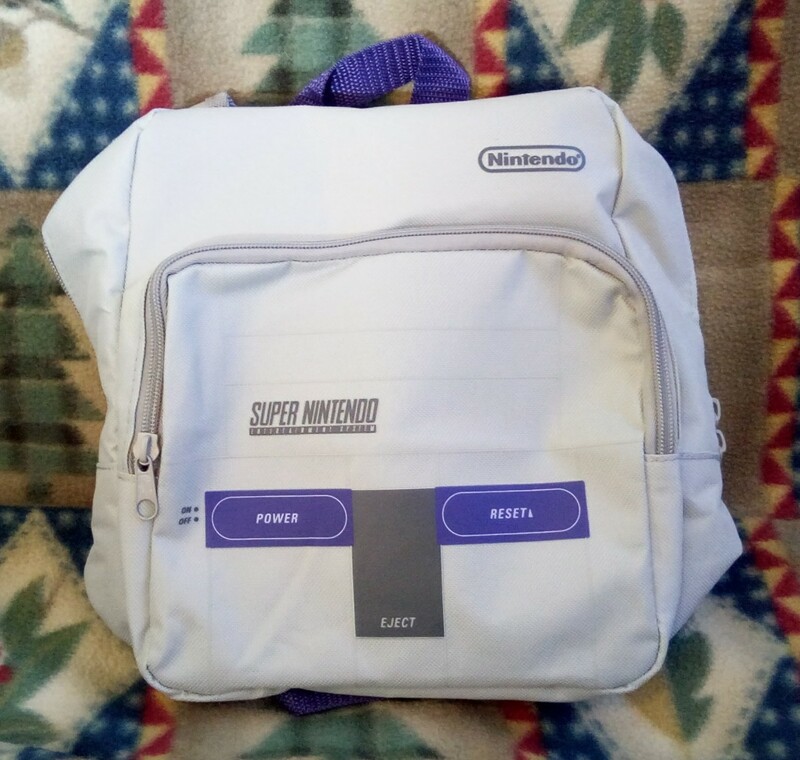 I've actually heard a few people say that this would be a great bag to store their Nintendo Classic in. Ideally, for me, it would be a great backpack to carry in place of my huge (and weighted) purse. And, sometimes, there are places that carrying a backpack is more convenient, such as a park, zoo, or even to the fair. 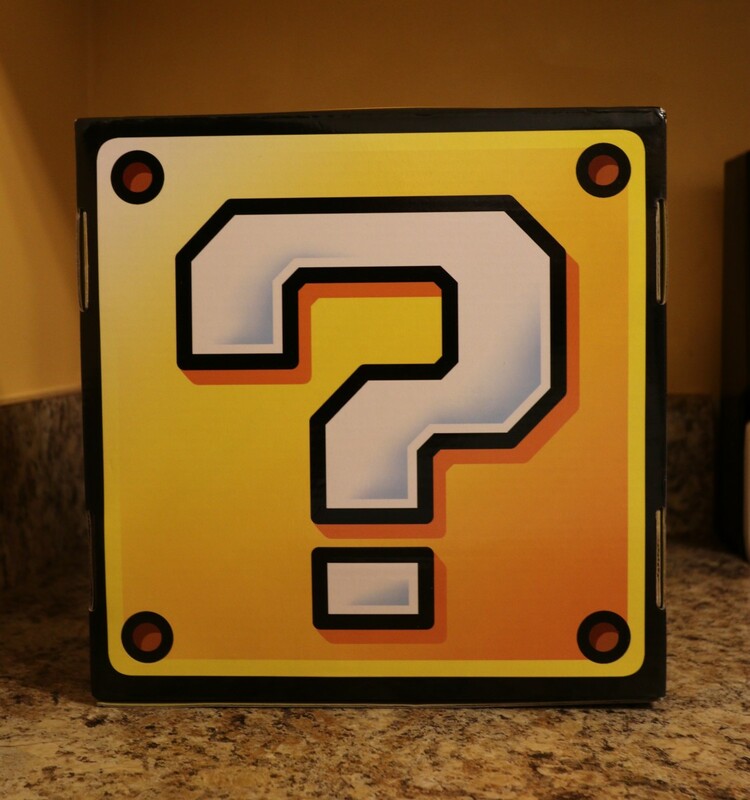 Warning: If you plan on getting this box and don't want to know what the exclusive mystery item is, exit now. If you want to know, keep on reading! Now, it's my understanding that the mystery item is the same in every kit. So, buying two boxes isn't going to score you different items. 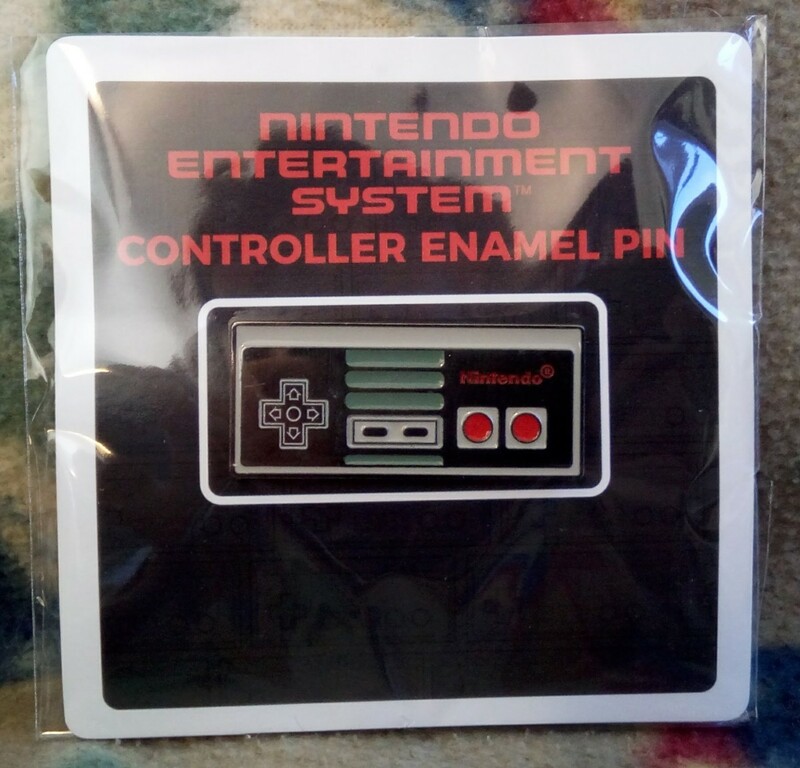 With that being said, the mystery item is a NES Controller Pin. The pin is approximately 1 5/8" wide and has two clasps on the back. I think this would be a great pin to attach to the SNES Console Backpack or even a blue jean jacket. The only thing that I would've liked to see done differently (besides what I already mentioned with the coasters), is there to have been multiple mystery items available. This would have made it more exciting for collectors trying to obtain all the mystery pieces in this release, and would've also increased sales for Nintendo and CultureFly. More sales equals more Nintendo collector boxes down the road. In conclusion, if you're a Nintendo fan, then I think you'll really enjoy this box. I've seen Nintendo heat changing mugs sell for around $10 and other Nintendo backpacks close to this size for $10-$15; so at those prices alone this box is well worth the $29.88 price tag.